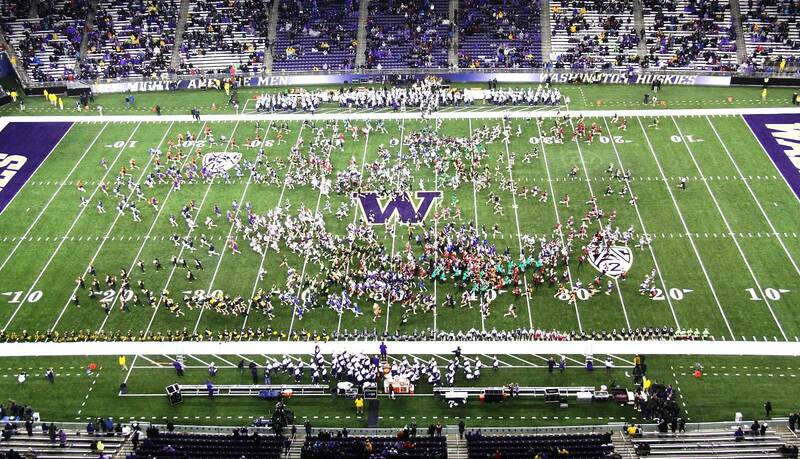 At a night game in Seattle on 9 November 2013, the University of Washington Huskies drubbed the University of Colorado Buffaloes, 59-7. Quarterback Keith Price was 22 of 29 in passing for 312 yards and had two passing TDs and two rushing TDs. Running Back Bishop Sankey rushed for 143 yards. All that’s very well indeed, but credit must be given where credit is due–it was High School Cheerleaders Day, so with that much support, it was impossible for the Huskies to lose! As a member of the Husky Alumni Band, I got to play my cornet again for the tail-gaters. I asked the band director if we could play “Hey Baby” which came out in 1961. We did, entertaining fans down on the boats moored to the docks at the shoreline of Lake Washington. Everybody loves to sing along and dance to those lyrics–“Hey, hey hey baby! I want to know if you’ll be my girl.” With a thousand cheerleaders at the game and the Huskies winning so easily, who wouldn’t be happy?! Here is a photo gallery of the game, focused on the UW Husky Marching Band (especially the trumpets) and Cheerleaders, plus all the high school cheerleaders. Field-level shots are by Louis Figueroa, and press-box shots are by Garry Nakayama. Please click on any photo to enlarge it. This entry was posted on May 29, 2014 at 6:41 am	and is filed under HMBAA - Husky Alumni Band. Tagged: band, Buffaloes, Cheerleaders Day, Cory Meals, Dr. J. Brad McDavid, Hey! Baby!, Huskies, Husky, Husky Alumni Band, Melvyn Poll, trumpets, University of Colorado, University of Washington. You can follow any responses to this entry through the RSS 2.0 feed. You can leave a response, or trackback from your own site.